With the new Millennium, the APAS-2000 became the first "Killer Application" of the new Century. With the APAS-2000, it is possible to utilize one camera for 2D or two cameras for 3D and transmit the digital data almost in "real time" through the Internet for immediate biomechanical analysis and quantification of movement utilizing large performance data bases. This technology affords the opportunity for every parent in the world to utilize the APAS-2000 to maximize the potential of their children in any physical activity and compare the results to others on the net. What an application !!! What a great feeling it is to know that a Biomechanical Application can become a "Killer Application" like Visi Calc; Lotus-123; Visio; Word; Excel and many others. What if you wanted a full 3D/2D Biomechanical System? What if you wanted to add to it a high speed video? What if you wanted to add to it a Force Plates System? What if you wanted to add to it an EMG System? What if you wanted it to include the most advance Gait Analysis System in the World? What if you wanted this system to be the most accurate in the World? What if you wanted to try it before you spend one cent on it to find out if the system meets your requirement? What if you found that the Motion Analysis system with less functions cost you over 450,000. A full description of the APAS-99 can be found on our main homepage. The following sections will describe the new features in the APAS-2000. As always, the APAS System represent the "cutting age" of technology and for the new Millennium represents unmatched capabilities by any other existing system. As always, the APAS System leads the pack with unmatched functions from any competitors. In addition to the fact that the APAS System is the most advance biomechanical system in the World, it is also the most affordable system. For a price around $5000.00, the APAS is comparable to other inferior systems which sell for over $300,000.00. It is beyond good sense why anyone would even consider other systems. With the fact that each APAS system is offered with additional workstations, it allows very efficient data analysis where more than one investigator can analyze data simultaneously and more then one project can be executed at the same time. So, the question is what could be added to the APAS-99 for the new Millennium. It is already the most advanced system in the World. Some of the APAS-2000 special features are disscussed below. 1. Full Digital Cameras support utilizing the IEEE1394 or as it called "Firewire" or "I-Link". This allow direct capturing of un-matched video quality without any degradation from the camera to the hard disk. 2. Multiple camera (4 cameras per firewire card), capturing in "real time" for real time 3D analysis. That means up to 4 cameras can capture simultaneously and 3D coordinates are calculated in "real time". 3. 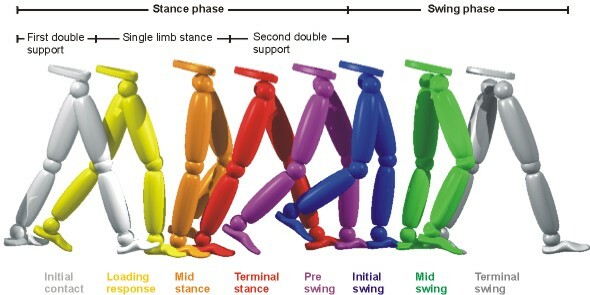 A full fledge Gait analysis (APASgait) utilize all existing markers sets. That means that the investigator can select any of the existing markers sets and make any comparison between them. 4. APAS Renderer - a display system which demonstrates the "human stick figures" in more realistic views. 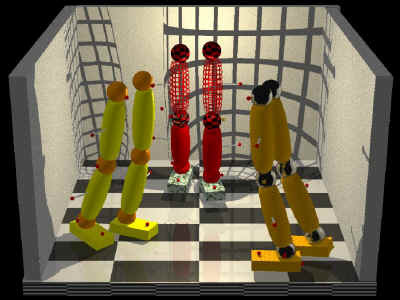 These doll-like stick figures can be super imposed with the vide which represents an un-matched visual display in 3D of the biomechanical results. 5. Quaternion analysis. For 6 degrees of freedom kinematics and Kinetics. This method of complex number system to analyze 3D movement from multiple cameras represents a revolutionary sophisticated method which resembles, in some way, the Herman Woltering suggestion of the "Helical Angles" method to determine movement in the Global Coordinate System. The Quaternion analysis takes biomechanical analysis one step further into the new Millennium for analyzing movement. 6. Implementation of all the above on any Notebook. This allow the investigator, the student, the professor, or others to carry their work with them anywhere. Also, demonstration of results can be projected in any gathering. The APAS-2000 full system is priced at only $6500.00. The APAS-2000 software including the full Gait System can also be purchased with additional hardware options. The items include 2 High Speed (120 Hz) cameras, the A/D board with Analog inputs for Force Plates and EMG, a Pentium computer (450 Mhz) with 10 Gig hard disk with 128 MB RAM, and a Firewire capture card with 3 digital inputs. The price for this full systme is: $19,500.00. This offer is absolutely amazing. Even if you own at the present a Vicon, Elite, Qualysis, or any other system, you should consider the APAS-2000 video based system as an addition to your existing system. The addition would cost you only $6500.00. If the APAS-99 is satisfactory for you, as it is for thousands of our customers, this version is priced at only $5000.00. So, please write me personally at gideon@arielnet.com and I will answer you personally for any question you have. Do not miss this opportunity. It is the offer of the Millennium.